Exhibition race in Lindvallen; elite biker showdown the day before Cykelvasan. 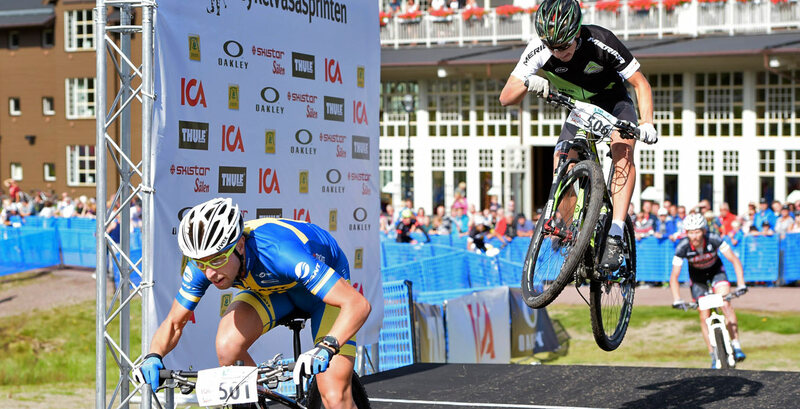 Cykelvasasprinten is an exhibition race for specially invited elite cyclists. An open qualifier for Cykelvasasprinten, where the public is invited to compete, will be held all week 32 and ends on Thursday, August 9th. A temporary track is built in the lower part of the Lindvallen ski slopes, making for a fun, crowd-friendly and technical race. The competition has a women’s and men’s class. Prize money is awarded to the victors in each class. Both the women’s and men’s class will, this year, be divided into three semi-final groups where the two fastest from each group advance to the final. Cykelvasasprinten takes place in Lindvallen, Sälen, Friday August 10 2018, the day before Cykelvasan 90. The open public qualification will be held all week 32 and ends at. 18.00-19.00 Thursday, August 9th. You bike a lap around the sprint track, no pre-registration required. Just bring your bike and helmet and you can compete in the qualifier. The three fastest ladies and gentlemen go on to challenge our invited elite cyclists in Cykelvasasprinten at 15:00. Fine prizes will be raffled between all participants. No participation fee. Invited elite cyclists will compete for victory in this year’s Cykelvasasprinten at 15:00 on Friday August 10, next to Ski Lodge in Lindvallen. The competition has a women’s and men’s class. Women’s and men’s class consisting of approximately 12 and 18 cyclists. The ladies like last year will have their own final. Each race is two laps of a short, technical and public friendly web which is situated in the lower part of Lindvallens downhill slopes.